The Uber Games Plastic Chess Set is a light but rugged, injection molded plastic set suitable for children. Although grown-up will want to put this impressive Uber Games set on a tabletop, kids prefer the floor. The plastic Uber Games pieces are made of rugged, waterproof, and UV-resistant injection-molded, hollow plastic. Light enough to take on an outing, you can count on people (especially kids) to walk up and make friends. 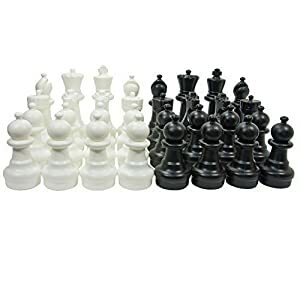 The Uber Games Plastic Chess Set is perfect for outdoor chess, fun for school, home parties and other occasions. Kids love large chess pieces.